Today is Frost Park Friday at Noon in downtown Tacoma at 9th and Pacific Avenue. Everyone is invited. Note: RR Anderson is offering a prize to the winner! My Lord. Twenty Chalk Off Episodes have transpired and the civic chalking fever is still alive. Measureless abyss of all vices and indecencies? 2400 - VOTES ARE TALLIED, THIS WEEKS "BEST ILLUSTRATOR IN THE UNIVERSE" CHAMPION IS CHOSEN. Chalk Challenge No. 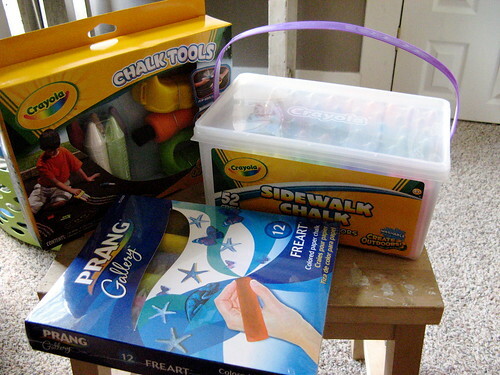 21 is made possible through THE RED HOT'S charitable donation of a plethora of UNIQUE CHALKING SUPPLIES to be AWARDED to the chalk artist who can INSPIRE THE FEWEST VOTES! effectively making the recipient of these prizes the first ever BEST ILLUSTRATOR of the ANTI-UNIVERSE (of Tacoma). However, the artist with the MOST VOTES, the BEST ILLUSTRATOR of the UNIVERSE (of Tacoma) will win a special handcrafted, thank-you card of mystery autographed by political cartoonist RR Anderson. get pumped, visit FeedTacoma.com's TACOMA URBANIST. Jeremy aka "The Garfield Kid"
Feel free to post any pictures of the chalk art work below in this post or link to pictures or picture sets including close up shots that may make your favored piece look better or your opponents look worse. 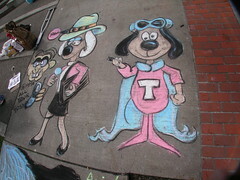 Please vote for the chalk art entry you believe is the best in the comment section below. Explaining why you believe the piece is the best will add considerable context and meaning to your vote. No doubt you will have friends and acquaintances who are in the contest. Do your best to be as objective as you can in your analysis of the chalk submissions which will strengthen the participatory voting system in place. Frost Park Challengers are encouraged to vote as well for an additional perspective to the event. Each person gets one vote. Votes will be accepted until midnight on Friday after which the winner will be declared. Votes will be accepted starting at 1:00 p.m. Please use the word "vote" for easy reference to the chalk submission that you believe is the best. 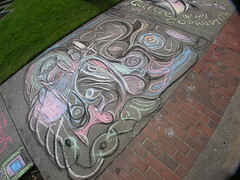 by Erik on 8/29/2008 @ 12:45am I was able to observe two people successfully complete this week's Frost Park Chalk Off puzzle. Not easy as completing the puzzle this week requires one to flawlessly complete the digital "2" in reverse. 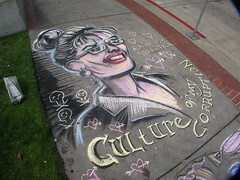 Heidi works at Maxwells on Friday nights where an increasing number of chalk off participants and fans congregate. by tacomachickadee on 8/29/2008 @ 9:22am dawntown: at least his pants were on in this one. by Adam the Alien on 8/29/2008 @ 10:36am However, the artist with the MOST VOTES, the BEST ILLUSTRATOR of the UNIVERSE (of Tacoma) will win a special handcrafted, thank-you card of mystery autographed by political cartoonist RR Anderson. I just wanted to draw emphasis to this, since I missed it in my first read-through. It's an important bit to note, since otherwise this prize-for-last-place thing becomes very confusing to draw for, let alone to vote for. A thank-you card of mystery from RR is just as tempting as a metric fuckton of chalk...if not more tempting. Hm...yeah, I'm gonna go with more tempting. Plus there's the whole Stowe trading card thing as usual, I'm assuming. I may or may not chalk today...I haven't really had time to just chat and film in a while, so I may just do that. I'll bring both chalk and camera and decide when I get there. by Erik on 8/29/2008 @ 11:00am Right on Adam. 1) Become a member of the Frost Park "Winners Circle." 2) Advances one to the "Best Illustrator in the Universe of Tacoma" for the Summer of 2008. 3) An original "hand crafted" signed piece of RR Anderson art in the form of a "thank you card." 4) Permanent status in the Art list serve former winner announcement. and whatever other media benefits out there. by Mark Monlux on 8/29/2008 @ 11:34am Sorry I won't be able to make it this week. Deadlines loom. And I will be in Kentucky next week. I hope you all won't miss me too bad. I promise to check back in and vote. by KevinFreitas on 8/29/2008 @ 1:13pm I stole Stowe as we're up at PAX today though he left his pony and glitter piece earlier for you vote avoiding enjoyment. Pics of him in action between nerd breaks. by NineInchNachos on 8/29/2008 @ 1:25pm under deadline so my wide-angle uploads will be later tonight... sorry! by tacomachickadee on 8/29/2008 @ 1:27pm The Chickadee Team entry contains a poem by Little Chickadee. Since you may not be able to read it, it says (without parental prompting): "Roses are read, violets are blue, sugar is sweet ... and chalk is too!" Ahhhhh. The life of an artist. by izenmania on 8/29/2008 @ 1:45pm With Lance and Monlux both out today, Stowe was the only one to Draw The Cowboy. Perhaps that theme will be executed properly next week? BTW, my theme was "underdog", seeing that the prize was meant for the underdog. Oh, and the prize giver also gives hotdogs, get it? I missed the part that the theme was "Draw the Cowboy" or turtle or whatever. by izenmania on 8/29/2008 @ 2:00pm Well it wasn't an official theme... just some discussion that came out of last week. Without previous consultation, Lance drew the turtle and Mark drew the pirate. So some notions were tossed around by them, Stowe and Andrea about drawing the cowboy. That's what you get for vacationing! Out of the loop! Prize entrant with most votes: hand crafted original card/art from RR Anderson. Prize entrant with the least entries: three containers of chalk supplies. RR Anderson : Sarah Palin Vice president? by Erik on 8/29/2008 @ 3:26pm RR Anderson's Sarah Palin entry is picking up a ton of traffic on my flickr account. It is obviously of a great interest to some people. by NineInchNachos on 8/29/2008 @ 3:41pm my pics! by ALT on 8/29/2008 @ 3:42pm Had work from 9:00 to 2:00 today. By the end of the day I had forgotten it was Friday! by Dave_L on 8/29/2008 @ 3:43pm By the way, we had tons of water to wash the sidewalk this week, but Iâ€™m sorry I didnâ€™t finish the job on the walls. I was only able to stop by very late during the week, and the fountains were dry both times, and it was too late at night to fetch water. Not that the response has been overwhelming during the week for assistance, but I was hoping to get to them. Looks like it didnâ€™t impede the chalking, though. As I exit-poll myself, I have to say RR's looks super, but I have to take some time to look at the others before actually placing a vote. The gentleman who had the pressure washer for sale was going to try to come to the chalk-off; I hope he did. He's a photographer with the State Legislature, and used to work at the Camera Shop on Pacific. More proof that you meet the nicest, most interesting people through Frost Park. by izenmania on 8/29/2008 @ 3:57pm Fear not, Dave... there were few enough chalkers that the wall-space wasn't needed. by NineInchNachos on 8/29/2008 @ 4:07pm Stowe used glitter, which is strictly forbidden. Though dazzling, I'm afraid Stowe is now restricted to the penalty box! What does that mean? I don't know yet! by Adam the Alien on 8/29/2008 @ 4:08pm Fear not, Dave... there were few enough chalkers that the wall-space wasn't needed. What was left on the wall would have been easily drawn over, too. I got there late, or I probably would've done another of my "draw-something-over-the-remains-of-the-old-thing (and include a scrub brush)" bits. by tacomachickadee on 8/29/2008 @ 4:09pm Ooh! THe first vote! For a moment there I thought everyone thought the Red Hot's prize might have been for the last person to VOTE. But nay ... still need to think about it though. Thanks for going first Dianne! by Altered Chords on 8/29/2008 @ 4:15pm I vote for Ariel. The fish were very captivating and from one angle they looked like faces. (you don't pick that up from the photo shown here so don't assume I had mushrooms for lunch). 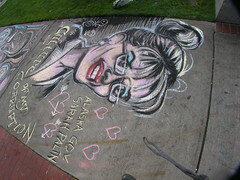 Very close 2nd was RR's Sarah Palin - the timeliness of it astounded me until I remembered that he is from Alaska and can probably draw all 27 of Alaska's residents on demand. by Dave_L on 8/29/2008 @ 4:29pm Hmmm, besides the premature chalkulation, that was a blatant violation of Rule # 7. I gotta give Stowe credit for having the nads to do it, though. Cowboy need some spurs that go jingle jangle jingle. by NineInchNachos on 8/29/2008 @ 4:31pm the black + white cowboy effect is awesome. by NineInchNachos on 8/29/2008 @ 4:31pm how dare you stowe. how dare you violate the glitter rule!! 2) Pre-chalking so he can go play at PAX. He better see the Dead Gentlemen's "Dorkness Rising" while he's up there ... gotta support the local boys. Wait, the rules are just for entertainment. Dangnabit. I want rules to break! by tacomachickadee on 8/29/2008 @ 4:42pm @AdamTheAlien I say no. Since RR is an ex-Alaskan now in Tacoma, and he ties the cartoon to himself, it's a definite "loose Tacoma theme." Just like your self-portrait. by KevinFreitas on 8/29/2008 @ 4:54pm I vote RR because his Palin makes me know exactly what a VP does. 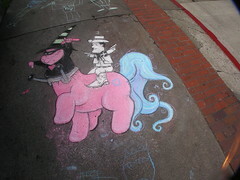 And that's look amazing in chalk. by Adam the Alien on 8/29/2008 @ 4:59pm @AdamTheAlien I say no. Since RR is an ex-Alaskan now in Tacoma, and he ties the cartoon to himself, it's a definite "loose Tacoma theme." Just like your self-portrait. You're assuming I don't think I broke the rule, too. I think I did. by Erik on 8/29/2008 @ 5:09pm I vote for Ariel. by tacomachickadee on 8/29/2008 @ 7:00pm Little Chickadee votes for Ariel. I'm still thinking. All that rambling aside, I'm going to have to vote for the unknown artist. I like the randomness of it all (or that's what I see). by Courtney on 8/29/2008 @ 7:41pm RR wearing that tight shirt made me laugh. Where's the Garfield kid this week?? I am voting for Ariel because it looks so pretty. And to think I pooh poohed Sto's glitter idea. by TacomaGnome on 8/29/2008 @ 7:50pm Being from the northern regions, I need to vote for RR. It fills me with pride to see him still donning my gift to him. Huzzah for R. Ryan Anderson! Huzzah! Huzzah! by jcbetty on 8/29/2008 @ 8:05pm yahbut... did anyone get a picture of RR in his tight 153?? by NineInchNachos on 8/29/2008 @ 8:43pm if you hate polar bears, vote for palin! if you love drilling for heavy sour crude you need to send to china to refine, vote for palin! if you love snowmobiles vote for palin! if you hate the people of Juneau, and you want to move the capitol of alaska to wasilla to make a few land developers rich, vote for palin! by Moltz on 8/29/2008 @ 9:05pm My vote goes for RR's Palin tribute. That's sidewalk change we can believe in! by tacomachickadee on 8/29/2008 @ 9:05pm Welcome Moltz. Good to see ya outside of Twitter. by jenyum on 8/29/2008 @ 9:11pm I love Ariel's this week. The colors are great and it really pops in a photograph. I also think Stowe's is freaking hysterical and I continue to admire his mastery of the in joke. Electric Elliot's (? not sure) cubist masterpiece was wonderfully random and well-crafted. But I have to vote for RR's Palin piece. So timely, so barbie-intimidating. Just perfect. by joel413 on 8/29/2008 @ 9:39pm I vote for the family Chickadee, I think the giant flower is inspired and the poem is perfect. by NineInchNachos on 8/29/2008 @ 9:58pm stowes glitter cowboy amputee is timely as well. by tacomachickadee on 8/29/2008 @ 9:59pm If my calculations are correct ... with two hours to go, Ariel & RR are each tied with 5. Team Chickadee has 1. Stowe has 1. And the Unknown Artist has 1.
by ALT on 8/29/2008 @ 10:02pm I vote for Dawn's mighty Tacoma Underdog. by NineInchNachos on 8/29/2008 @ 10:03pm the underdog was awful mighty. by ElectricElliot on 8/29/2008 @ 10:23pm I vote for Mr. Adam the Alien and his fancy new hat. by tacomachickadee on 8/29/2008 @ 10:51pm I vote for Dawn and the Underdog. 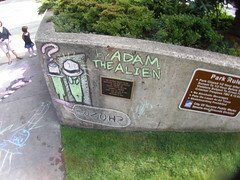 by takhoman on 8/29/2008 @ 10:53pm I would vote for Adam as his Aliens look suspicously like Thea Worms with a fedora. However I have to go with RR's breaking news of the day Sarah Palin for Veep. It a fab rendition of who was known in high school as "Sarah Barracuda". Besides I am now asking RR if I can reprint it. Just curious, if RR wins this week will he be sending himself a thank you card? by Mark Monlux on 8/29/2008 @ 10:54pm Had I made it today, I was going to do a "Dogs of War" theme. So, I'm going to vote for the closest dog theme and that would be Underdog. Though, I was tempted to vote for the rule breaking Stowe and his cowboy. I still think we should do a cowboy theme sometime. Stowe set a great example. Kudos to RR for a fantastic image. All that was missing was the oil. Or was I not looking close enough? by Rue on 8/30/2008 @ 12:08am I'm not sure who to vote for because I'm not sure if it will help make them win or lose. I vote for the T-town Underdog. by ensie on 8/30/2008 @ 12:08am I vote for RR's Palin. She is frightening. If they do, I vote for RR. 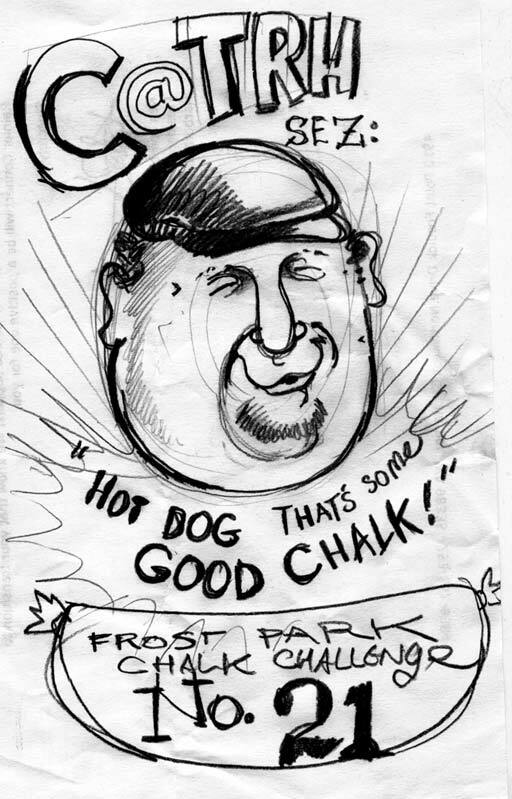 by Erik on 8/30/2008 @ 12:52am Interesting Frost Park Chalking Day. Yes, there were fewer people who attended. One can speculate whether it was a three day weekend, PAX event, or the strange prize senario. At any rate, here are the results. 22 votes counted, 4 of which probably would not count due to some technical issue, but fortunately, do not change the outcome. Electric Elliot = zero votes!!! "special handcrafted, thank-you card of mystery autographed by political cartoonist RR Anderson." Prize for Electric Elliot = three containers of chalk from the Red Hot. I don't see anyone else who didn;t get any votes, but its hard to prove a negative. by ElectricElliot on 8/30/2008 @ 12:59am Hooray! I am the loser! And champion of the Anti-Tacoma Universe! by Erik on 8/30/2008 @ 1:00am Congrats Elliot and RR! However, not everything may be what it seems. RR Anderson has broken a record in Frost Park by winning two Chalks Offs in a row. This makes me consider that perhaps RR was holding out during previous episodes letting other contenders win while he planned a come from behind victory. Did RR improve over the last few months or was he holding back his talents so he could add drama later? Was he sitting contently sketching Tacomic like entries week after week watching everyone else battle it out when he knew he could prevail at will? Here is a comparison of RR's chalk off sketches in different weeks. Draw your own conclusion. I would have to verify this later. But I believe it is currently a three way tie between Andrea, RR and Stowe (in alphabetical order) with four wins a piece. by NineInchNachos on 8/30/2008 @ 6:50am thank you everyone. the real winners this round were the people of alaska... who face a desperate time of extreme political corruption. I try to comfort my ex-people with this artwork of solice (free of charge and spared no expense). reprint at will my friends! 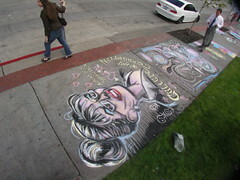 and god(s) bless the united chalk artisans of America! by NineInchNachos on 8/30/2008 @ 6:51am also, nice maneuvering Electric Elliot. by ElectricElliot on 8/30/2008 @ 8:55am Thanks RR. 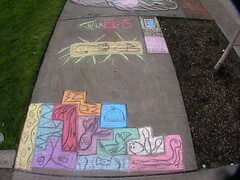 As I hit Frost Park yesterday I realized, nobody likes Tetris because you can never win. The game just goes on and on until level 99 or something. That's just not satisfying. Therefore, because of everyone's subconscious dislike for Tetris, I knew Anti-Victory was in the bag. by beerandhotdogs on 8/30/2008 @ 1:27pm You know the weird thing is, I just bought a mini handheld Tetris game, and have been cussing it for beating me over and over. There is some cosmic forces at work here, my friends. Electric Elliot, you are indeed the winner of the One For The Little Guy Prize Package. I have no idea how to get it to you, but hit me at delicioushotdogs at gmail dot com and we'll figure the shizz out. by Erik on 7/3/2009 @ 1:36pm News Alert: Sarah Palin has resigned from being governor of Alaska!